I'm postponing my 4th of July menu till tomorrow, so come on back. An Edible Souvenir from the French Quarter.... I love the excitement of travel, the rush of finding yourself in a new city full of new possibilities, new architecture, new art, new restaurants, new people... But I also love to come to familiar home and share what I've found and what I've learned with my family. A lot of what I learned will not interest them, like the better governance policies for charter schools and guidelines for teacher merit pay. But other things, like how to make sweet and powdery beignets , how to lose yourself in the quest for the perfect balcony in the French Quarter, and how to dress yourself up for Mardi Gras are vastly interesting to my children. My mother used to make a list of everything she ate during her travels and then come home and recreate it for the family. 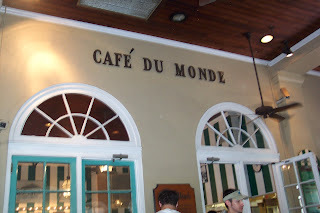 Like minded, after a visit to the famous Cafe Du Monde, I bought a beignet mix. I'm almost exclusively a from scratch kind of girl, but I thought it might be fun to let my kids have a crack at the mix version of a New Orleans classic. You can buy it here. So now it is Saturday morning and we've had a lovely sleep in, late exercise, and hot french donut kind of morning. The kids were able to manage everything but the frying. And while not perfect, they were pretty darn good, hot and fresh and covered with powdered sugar. Quiet Man is notably absent, catching up on his doctorate work that he missed while he did the stay at home routine this week. We meant to save him a beignet, but we'll just have to make another batch. What a fun trip! 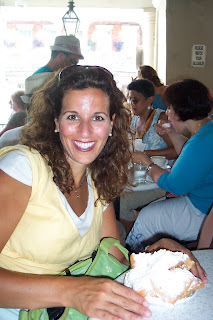 Those beignets looks sooo good! And your kids looks very fancy, all dressed up for Mardi Gras! yummy. those beignet look like they turned out pretty well, even if they did start with a mix. and what fun mardi gras duds you brought back! i'm sure that they were thrilled to have you home. Your kids are absolutely the cutest. I love New Orleans, but haven't been to visit in a very l-o-n-g time. Looks like you had a grand time!